The rapper points a gun at a clown-styled President Trump in the promo for Lavender, his remix of BadBadNotGood and Kaytranada's hit track. 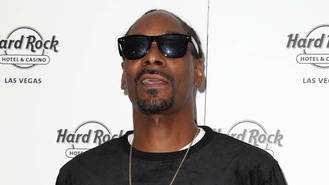 Snoop Dogg, who took part in a rally to bring cops and the Los Angeles black community together last year (16), attacks police brutality on the track, rapping, "Trying to keep from dying in these muthaf**kin' streets/F**k the police, from a black man's point of view." "It's a lot of clown s**t going on that we could just sit and talk on the phone all day about, but it's a few issues that we really wanted to lock into, like police, the president and just life in general." Jonas Blue is heading into the studio with Craig David in April. Ed Sheeran "wasn't really comfortable" taking his shirt off for his 'Shape of You' music video. Kesha was so hungry at the height of her bulimia battle she almost ruptured the veins in her brain. Late singer George Michael has reportedly left his $12 million (£10 million) London mansion to his older sister Melanie. Travis Scott has joked he “flew” rather than fell during his now infamous performance with Drake last month (Feb17). Adele decided against bringing her pet pooch Louie on her Australian tour after Johnny Depp's dog-smuggling drama. Kristen Stewart has teamed up with synth-pop group Chvrches on a mystery collaboration for Planned Parenthood. will.i.am is to record his new music video on the 'Coronation Street' set on Tuesday (14.03.17). Charli XCX has been "floored" by Camila Cabello's talent.